Weekly Astro/Tarot- STAY FLEXIBLE & OPEN! This week we're starting off with a power struggle between Mars (the planet of drive) and Pluto (the planet a transformation) in a tense opposition! Mars is uncomfortable as it is currently moving through the sign of cancer, a sign that is sensitive, intuitive, and receptive. Mars wants to shoot forward but with the energy of Cancer supporting it it is asked to factor in emotions, feelings, and gut instinct. Pluto is on the opposite side and challenges Mars. So on the 2nd, the 3rd, and the 4th of this month you can expect some resistance with working with others, struggles with authority, and issues with creating balance in relationships. Remember, Mars wants to push forward while Pluto questions if Mars is ready or capable so these are some things that you can prepare to see within your own personal life- in work, love, and relationships. It's best not to push or fight unless you absolutely have to. Respect of yourself and others is in upmost with this type of transit! On the 4th Venus (the planet that rules love, relationships, and beauty) moves out of the sign of Taurus – a sign that is earthy and grounded – into the sign of Gemini. Our energy, attraction, and values switch to things that engage and capture the curiosity of our minds.Venus in Gemini wants to explore, discover, and experience but mostly learn! For those looking for love you want to get out and about in social settings that are light and fun because where Venus moves within our charts is where you'll find beauty, love, & fun! For those that are attached this is a great time to learn new subjects and things with your partner! Take new classes together & try new things!When Venus was in the sign of Taurus we found ourselves needing comfort & security but now that it's in the sign of Gemini and we are stepping outside of our comfort zones and exploring what the world has to offer us! On the 5th, Mercury (the planet that rules communication and thought) moves into the sign of expressive Leo!Leo is known for acting upon its heart, for putting on a show, and expressing itself and you will see within yourself and others these traits manifesting themselves in your communication and thinking process! A month before your focus was on your feelings and intuition but now your focus shifts in expressing and sharing! This is a great time to share your ideas, your thoughts and to be creative! Also on this day the sun squares with Jupiter (the planet of abundance). With this we want to be careful that we're not overdoing it... especially with mercury moving into the sign of Leo. We can step on other people's toes, overpromise, or exhaust ourselves! Be aware! On the 8th we have the full moon that is happening within the sign of Capricorn! Capricorn rules our long-term investments and vision and with the full moon bringing things to a head you should see the results of your efforts from the last few months revealing themselves now. If you've been working hard and you've been focused then you will begin to watch things unfold further in the way that the universe wants them to because the full moon brings things to culmination. This full moon will also cancel out things that the universe knows will not serve you in the way that you deserve for the long term. Capricorn energy focuses on the future and hard work and with the full moon bringing things into our awareness you want to know what you need to release by what is naturally ending and you will have the opportunity to open up to what will ultimately best serve you! Trust the process! With this full moon the moon sits directly on top of Pluto (the planet of transformation and death) so whatever needs to be released during this time will absolutely show itself and you will need to purge- trusting that what you let go of will manifest itself in a new and fresh way that is far better than what you are being asked to let go of! Remember, Mercury now is in a sign of Leo and when you're setting intentions you're going to be using the power of mercury- which rules the mind and your thoughts- to think big and ask for your hearts true desires! Look at the energy of the planets to give you clues and see what is unfolding and happening within the cosmos and influencing us here down on earth! On the 9th the sun (which rules our life energy) and Pluto (ruling transformation) are also in a tense opposition showing me that the energy of evolving and being flexible and open is key for this week!If you are rigid you will struggle – you'll find more opposition and trouble then if you allow yourself to flow especially since were coming out of a time where the planets were in the sign of Cancer which was sending you signals as to what you need to be aware of within your personal life! The full moon begins to bring all of those things to a head and riding the wave this week is far more beneficial then to fight the wave! Be open! Be open! Be open! 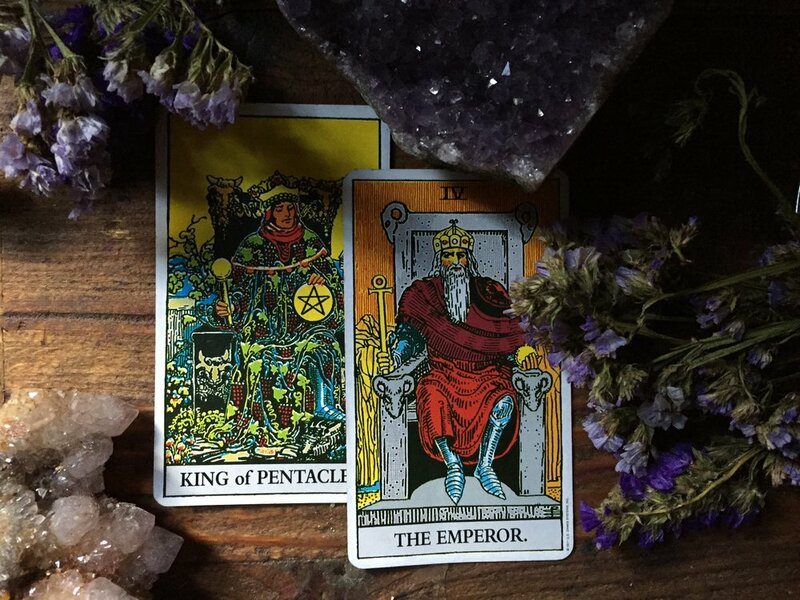 The energy of this week revolves around the essence of transformation and evolving but throughout it all you want to channel the energy of the Emperor and the king of pentacles by staying grounded and centered! Both of these cards are knowledgeable and leaders and the two of them work together to show you how important it is to stay focused, to know and state what you want, and to go after it with commitment & dedication! Certain areas of your life are in the process of shifting so as shaky as the ground may feel in the moment don't give up or loose focus. Take your time- one step at a time- and you WILL get there! CAPRICORN FULL MOON- POWERFUL TRANSFORMATION! JULY 2017 Astrology Forecast- FOR ALL SIGNS!